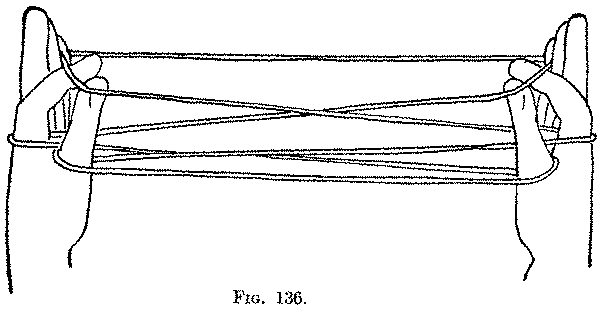 Dr. Haddon taught me this figure in August, 1904. He learned it in Chicago in 1901, from the two old Navaho men who showed him "Many Stars" (5, p. 221, pl. xv, Fig. 2). It is called by the Navahos, Chiz-jǒ-yĕt-lĭ. There are two examples of the finished figure in the Culin Collection of the Philadelphia Free Museum of Science and Art, one (22724) from the Navahos at St. Michael's Mission, Arizona, is labelled Chizh-joyeli = Hacking the Wood, the other (22605) from Zuñi, New Mexico, is called Pish-kap-po-a, pi-cho-wai-nai. Second:Put the tips of the thumb and index of each hand together, and bind these fingers away from you over the far index string, and pick up from below the near little finger string, and return the thumb and index to their usual positions (Fig. 136); then separate their tips and release the loop from the little finger. This movement transfers the little finger loop to both thumb and index (Fig. 137). Third: Keeping all the loops carefully in place on the right hand, with the right thumb and index lift the lower loop on the left thumb up over the upper loop (the one passing around both thumb and index), then entirely off the left thumb (Fig. 138), and let it drop on the palmar side, being careful not to take off also the upper loop. Then with the right thumb and index lift the left lower index loop over the upper index loop (the one which passes around both thumb and index) and off the index, and let it drop on the palmar side. In the same manner, keeping the loops in place on the left hand, with the left thumb and index lift the right lower thumb loop up over the right upper thumb loop (the one passing around both thumb and index), entirely off the thumb, and let it drop on the palmar side. Then with the left thumb and index lift the right lower index loop up over the right upper index loop (the one passing around both thumb and index), entirely off the right index, and let it drop on the palmar side. 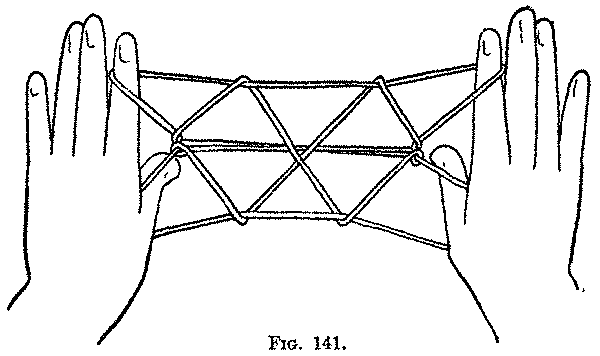 You now have on each hand a single loop passing around both thumb and index, and on that part of this loop which passes from the back of the thumb to the back of the index are two more loops (Fig. 139). Of the four strings forming these two loops, two are upper strings and two are lower strings when the figure is held horizontally. Of the upper strings, the far one runs obliquely away from you and passes over the far index string, but the near one passes straight across to the other side. Fourth: Now bend each thumb away from you, and pull down this near upper string (Fig. 140), (which can always be recognized as being the only free straight string passing across over the figure), and letting the loop slip off the thumb, extend the figure between the thumbs and index fingers, holding the palms away from you (Fig. 141). 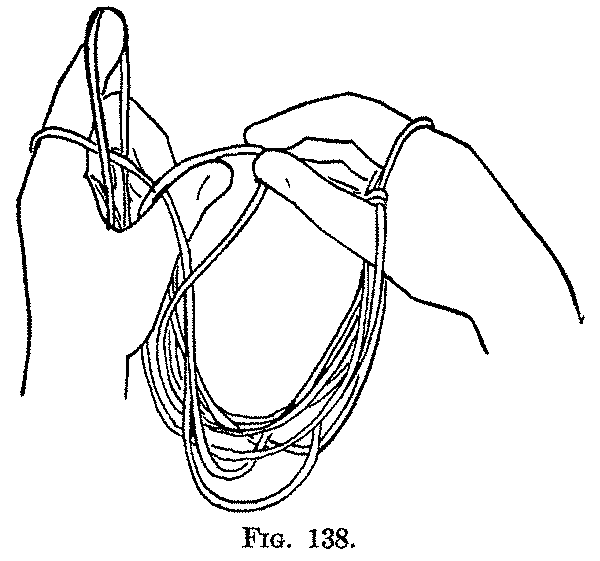 Fourth A: Put each middle finger from below up on the far side of the near upper straight string, and bending the middle frnger, pull this string down, of course on the near side of the other three strings; then letting the loop slip off each thumb, extend the figure between the index and middle fingers, and at the same time turn the palms away from you. "Carrying Wood" is made up of some of the simple movements of "Many Stars" and a new one, the Second.